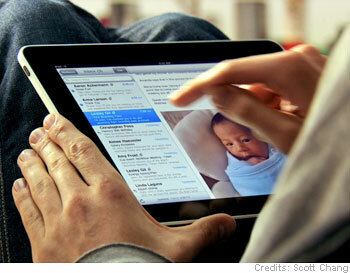 International Apple (AAPL) fans will have to wait longer to get their hands on iPads. Apple Inc. announced this morning that it will postpone the international launch of its tablet computer by a month because of stronger-than-expected demand for the device in the United States. The co. said iPad has been a “runaway success”, outstripping supply and already selling over 500,000 units in the first week it was on the U.S. market. The iPad tablet was originally scheduled to go on sale April 24 in Australia, Canada, France, Germany, Italy, Japan, Spain, Switzerland and the U.K.
Pre-orders for the international version of the iPad will begin May 10. “Although we have delivered more than 500,000 iPads during its first week, demand is far higher than we predicted and will likely continue to exceed our supply over the next several weeks as more people see and touch an iPad(TM). We have also taken a large number of pre-orders for iPad 3G models for delivery by the end of April. Yair Reiner, an analyst at Oppenheimer & Co., talks about Apple ‘s decision to delay introduction.